DEFY® Exterior Wood Stripper is a biodegradable, easy to use deck stain remover that will quickly remove stain wood finishes to restore the natural beauty of wood surfaces. Stains and varnishes are removed along with collected dirt, mold, mildew and mill glaze. This deck stain and sealer remover will remove most oil and latex based finishes including: clear film-forming varnishes, polyurethanes, solid color and semi-transparent stains. 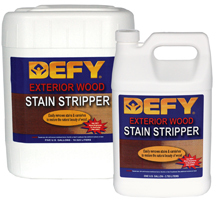 To find out how to remove wood stain with DEFY® wood stripper, read below. 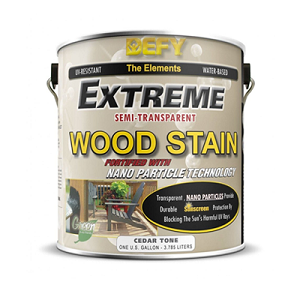 DEFY® Exterior Wood Stain Stripper will remove weathered solid color stains and varnishes as well as semi-transparent stains that cannot be removed by simply cleaning. If unsure whether the wood needs to be stripped or just cleaned, test a small, inconspicuous area to determine which method will provide the best results before proceeding. DEFY® wood stripper will cover 100-150 sq. ft. per gallon and is sold in 1 or 5 gallon containers. Applying a generous amount of this deck stain remover with a polyester brush, roller or pump-up hand sprayer and then allowing it to sit for 15 minutes will cause the finish to begin to lift and remove stain wood finish from the wood’s surface. After the finish begins to lift, scrub with a stiff bristle brush in the direction of the wood grain. After scrubbing, rinse with large amounts of water in the direction of the wood grain. Using a pressure washer, although not mandatory, will eliminate the need for scrubbing. However, particular care should be taken with a power washer to avoid damaging the wood. After rinsing, you must neutralize and brighten the wood with DEFY® Wood Brightener immediately. If stubborn areas remain, repeat the application in those areas. From Terry Mullin of Watkinsville, Georgia on 10/9/2013 . From Ronald Vansant of Sea Isle City, New Jersey on 5/8/2013 .